Registration is now open for the 2019 IIG/DLIG Spring Workshop! Academic librarians are asked to deliver instructional sessions to students, but often lack training in presentation development and audience engagement. In this workshop, we’ll discuss instructional design at a very high level, then get hands-on experience working through each step of the design process so that each participant walks away with a sample roadmap to follow when planning their own session. Hanna will be focusing on helping participants create learning outcomes appropriate for library sessions, and will then pair them with the delivery and the use of high and low/no tech options in the classroom to get students engaged. A new way of thinking about technology and active learning will be presented, helping every single person who walks out to have more confidence that their teaching style is getting the outcomes they hoped for. Carolyn Kraut is the Online Instructional Designer for the University of Findlay. She has dedicated her career to helping faculty create meaningful and engaging learning experiences in the classroom and online. When she’s not educating educators, she likes to cook, solve murder mystery subscription boxes, and spend time outdoors with her husband and two dogs. Having received her Masters of Science in Information from the University of Michigan in 2011, Hanna took a unique path to her current position. Starting as a small business owner archivally digitizing memories, she then followed an opportunity into academia working side by side with many of the instructors that set her on her path. Being unimpressed with the library instructional sessions she had encountered as a student made her throw herself into how librarians could best conduct the instruction of Information Literacy skills, at that institution and beyond. In December of 2015 she packed up her life and moved just 20 minutes east of Columbus, Ohio. The Ohio State University at Newark also home to Central Ohio Technical College was her new home, allowing her to continue her focus on Information Literacy as a Reference and Instruction Librarian there. In 2017 she shifted to the Columbus campus, still working for the University Libraries, but now as an Instructional Designer. It was time to give back what she had learned as a librarian, helping others who teach within libraries with creating learning objects and teaching with technology. She focuses on creating student driven sessions, thoughtfully utilizing emerging technologies while creating easily adaptable and reusable digital objects and lesson plans to ease the load of juggling busy semesters. DLIG and IIG’s co-hosted Spring 2018 Workshop offers a variety of different sessions on how librarians are applying the ACRL Authority Frame for Information Literacy to the design of assignments, sessions, and online tutorials that help students evaluate sources critically. The workshop will also include round table discussions of the presentations, and attendees will have the opportunity to share their own ideas and experiences. Come with your questions and perspectives, and leave with great design strategies, ideas and tips! Dr. Mary Hricko is a Professor of University Libraries and serves as the Library Director at Kent State University Geauga Campus and the Regional Academic Center. She is one of KSU’s Coordinators for Quality Matters and serves on the Instructional Technology Council’s Taskforce for Accessibility in Distance Education. She is one of OhioLINK’s Affordable Learning Ambassadors and is the Chair for the Open Textbook Library’s Research Group. In addition to her library work, she teaches courses in English and education and received an NEH Fellowship from the Newberry Library this past summer for her research on Langston Hughes. She has published numerous articles and books on quality assurance in online education. Her current research involves personal learning environments, web accessibility, and assessment in online education. This presentation will provide an overview of the research associated with the “best practices” for online instruction to assist library staff in designing and delivering online library tutorials and educational programs. This session will provide an overview regarding curricular alignment, accessibility, and quality assurance. We know the difficulty of even beginning to broach a topic as broad as source evaluation in a one shot session. I will outline my approach, which is to be a talking head only briefly to outline the basics of DRAMA (Date, Relevance, Accuracy, Motivation and Authority), a concept that is all too familiar when use of academic sources is still new, and then pair it with demonstrating learning technologies that allow the students to assess using DRAMA, finally paired with another learning technology creating friendly competition that encourages honest and real discussion among students. An overview of the presenter’s new system of library instruction modules, from which instructors of record can choose classroom teaching topics, including authority, source and other necessary evaluation concepts. In the current environment of ubiquitous data, telling students not to use Wikipedia and other online resources is unrealistic in light their information usage patterns. Our task as instruction librarians should be to teach students how and when problematic and/or biased sources can be used. This presentation will demonstrate a structured scoring system (1 through 4) for online texts and other resources that was developed in concert with Glenn Muschert, a professor of Sociology at Miami University. It will also present a series of scaffolded assignments that employ this scoring system to teach students the relative value of information sources. Using a combination of LibWizard and Canvas modules, instruction librarians at Northern Kentucky University have increased information literacy exposure for online students. This presentation will highlight modules that teach online students to ask critical questions about the information they encounter and extend student thinking beyond the traditional evaluation criteria of author, date, relevancy, and accuracy. Using LibWizard, students are able to interact with embedded sources, question the information, and respond to provided questions. Canvas offers a less interactive environment, but easily integrates within student courses. Librarians will share examples, engage discussion, and share findings based on experiences in the last year. How Might A Psychology Professor Teach Critical Thinking? Teaching critical thinking is addressed from the perspective of a psychology professor and a librarian. Methods used to improve student understanding of validity and reliability of sources are examined from the perspective of a classroom and online psychology professor. Lecture material, assignments, and discussions of real-world problems are included with a focus on developing critical evaluation skills as well as impressing upon the students the importance of choosing to be responsible consumers of information. Lessons learned while teaching critical thinking as a psychology professor are applied to the teaching of critical thinking as a social sciences liaison. I used the fee-based instructional design tool Articulate to design a module encouraging students to consider bias as they evaluate sources for timeliness and reliability. The lesson that discusses bias is placed within the larger context of the research process that also includes framing a research question and gathering evidence to support the thesis. The lesson includes activities and demonstrates different features of the design tool. How do you meet your distance students where they are for instruction? With attention spans set by social media behavior, how do you ensure your instruction message gets across? We created a tutorial library – the Learning Commons Passport – with short, navigable and succinct instruction videos that are accessible to learners across the globe and that instructors can embed in their courses. We worked with our IT and interactive media teams to create the structure and templates, but maintained ownership over the site and videos so we could quickly create needed tutorials, push edits, and provide the most up-to-date resources. Have you experimented with in-person or online strategies for getting students to think critically about the construction, credibility, or influence of information sources? Would you like the opportunity to share your experience with designing assignments, instruction sessions, activities, or tutorials that focus on critical source evaluation? If so, the Academic Library Association of Ohio’s (ALAO) Distance Learning and Instruction Interest Groups invite you to share experiences at our 2018 Spring Workshop, “Authority, Source Evaluation, and Critical Thinking for In-Person & Online Library Instruction” on Friday, May 4th at the State Library of Ohio. ALAO’s Distance Learning and Instruction Interest Groups (DLIG & IIG) are looking for presenters who have created assignments, tutorials or other library instruction programming that address source evaluation and/or the ACRL Authority Frame. Do you have fresh ideas you’d like to present? Now’s your chance! Session proposals will be reviewed by the DLIG/IIG workshop planning committee. Please email any questions to IIG Co-Chairs Mark Eddy (mark.eddy@case.edu) and Mandi Goodsett (a.goodsett@csuohio.edu), or DLIG Co-Chairs Kristin Cole (cole1@otterbein.edu) and Rebecca Quintus (quintus@findlay.edu). Mark your calendars and please join us this coming May 4th, 2018 at the State Library of Ohio in Columbus for our annual Spring Workshop! This year’s program will again be dedicated to exploring practical applications of the ACRL Framework in creating information literacy instruction content. More workshop details and program information coming soon! IIG’s Spring Workshop offers a variety of different sessions on ACRL’s Framework for Information Literacy for Higher Education. Come with your questions about the new Framework and leave with great ideas and tips. 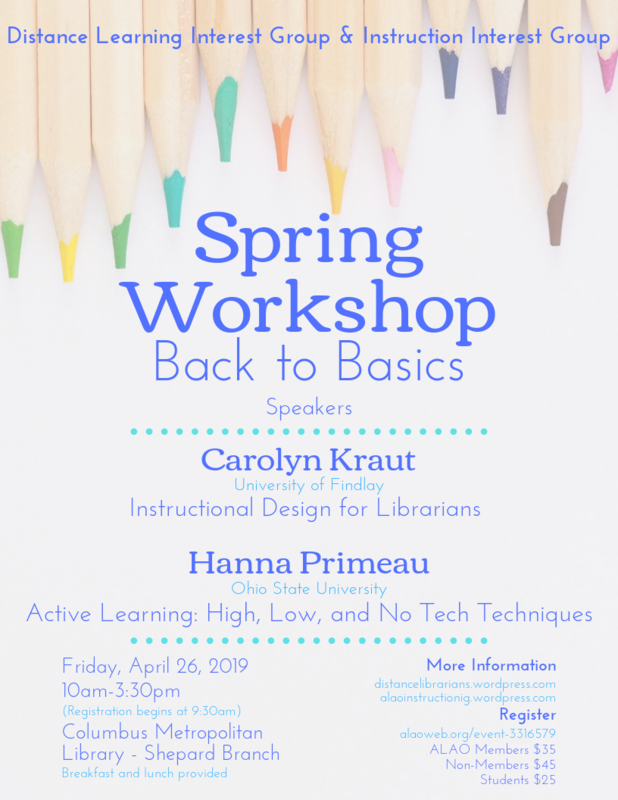 In “Bring in the New by Tweaking the Old!” Information Literacy Coordinator Rares Piloiu (Otterbein University) will introduce librarians to instructional methods and strategies to help them incorporate the Framework into their teaching. In “Integrating College Learning Goals and the ACRL Framework into Information Literacy,” Special Initiatives Librarian Rosalinda H. Linares (Oberlin College) and Visiting Asst. Professor Kathryn Miller (Oberlin College) will discuss a librarian-faculty collaboration to map college learning goals and the ACRL Framework to essential, discipline-specific threshold concepts in two introductory course. The day will also include round table discussions about the ins and outs of the ACRL Framework to provide participants the opportunity to share their own ideas and experiences. Yes, I just quoted a fashion expert and media personality, but it’s insanely relatable. As a fairly new professional (not quite two years in) who consistently fills her plate too full, likes to experiment, and has high expectations, I have to remind myself that doing it all does not imply that I am doing it all well. Sometimes…let’s be realistic, most of the time we have to choose and prioritize our ‘To Do’ lists and balance our capabilities. And our ‘To Do’ lists continue to grow. A wise, seasoned colleague of mine, Sherri Saines, once shared her golden rule of instruction when it comes to selecting her session content: one learning outcome/concept per 15 minutes of your session. What this means is that within an average, 50-minute session, you may teach three concepts. (Perhaps three Frameworks.) Three. Why? It’s estimated that the average student can focus and absorb a new concept for about 15 minutes at a time. In theory, if you spend less time, they may not understand or remember what you taught them. However, if you trail on forever, you could lose their interest. So 15 minutes is a guideline for time spent per concept, but assuming this guideline applies to everyone and every concept may not be accurate. I myself tend to think of ‘concept’ more as a theme. For example, I should not teach search strategy without ensuring the students know where to access the library databases. Or I cannot discuss searching for a specific level of evidence in healthcare and medicine if the students are unfamiliar with the different levels of evidence. So depending on the experience of the students, I may make the assumption that reminding them where to click on the library’s website will not take a huge amount of brainwork. So I might wrap these together as one theme and not two individual concepts that will independently take 15 minutes to make concrete. Including active-learning strategies and engaging activities is very important to my instruction methodology. There are two reasons for this: the first is I really enjoy interacting with the students and experiencing their engagement with me, the content, and each other. The second, and more important, is that active-learning strategies have proven to be the most effective method when working with diverse learners. For example, lecture is more ideal for those learners who prefer to listen and absorb. I tend to include PowerPoints, reflection time, and self-paced activities for those self-learners. And for those learners who need an example or need to activity try something, I plan an activity where they perform a task or discuss with their peers. My goal is to create a learning space that is flexible and adaptable to different kinds of learners. Balance, variety, and natural flow are important to me when I build lesson plans. I begin by dividing my more traditional lecture content into smaller tidbits, or themes. Then add an appropriate active-learning strategy per theme. While doing so, I remind myself that the active-learning strategy, if done well, should lean more towards replacing my lecture or demo time; not simply reiterating my concept. Side note: you can integrate a simple assessment into an active-learning activity, so two birds, one stone. That being said, you can’t do every, creative active-learning strategy invented in one session, and you shouldn’t try. I mean, technically this is possible, but I do not see how successful it would be. You still have to guide and create a learning space that jives with different kinds of learning styles. So let’s look back to the math. For a 50-minute session I can teach three concepts, one through a well-designed, more intense, active-learning strategy. This builds my base of prioritizing my content because it’s a formula. Adding this method to the madness works for me, providing a solid foundation on which to place my creativity and expectations. Not everything you do in a session needs to be ground-breakingly brilliant and meet very instruction criteria out there, another pressure we put on ourselves. What we should do is focus on steadily working towards that “perfect” instruction session with the understanding that we will probably never get to Library Instruction Nirvana- if it exists. I’m not asking you to lower your expectations but rather strategize your pace and methods. By intentionally choosing to experiment with active-learning you make slow, more accurate progress toward Library Instruction Nirvana; which is the goal, right? Trying to do everything does not ensure you are doing it well. Choose what is most important, most valuable, and most exciting right now– and do it fabulously. Bain, K. (2004). What the best college teachers do. Cambridge, MA: Harvard University. Burkhardt, J. (2016). Teaching information literacy reframed: 50+ framework-based exercises for creating information-literate learners. Chicago: Neal-Schuman, an imprint of the American Library Association. Hanna Schmillen is a new professional who started her first post-MLIS position July 2015 as the Health Sciences and Professions Subject Librarian at Ohio University. She’s engaged in Academic Library Association of Ohio (ALAO), the Music Library Association (MLA), the Midwest chapter of MLA, and the Ohio Health Sciences Library Association (OHSLA). Her research interests include instruction strategies, the training and education of new and soon-to-be librarians, as well as data management and eScience. Hanna also has the cutest mutt named Mosby, who is a German Shepard, Corgi, Basset Hound mix; likes to kayak, hike, and hammock whenever possible; and loves to cook and bake. Have you begun piloting or experimenting with applications of ACRL’s new Framework for Information Literacy for Higher Education? Do you have an assignment or activity to share on a threshold concept? Do you have a fruitful collaboration with faculty in implementing the Framework at your institution? If so, the Academic Library Association of Ohio’s (ALAO) Instruction Interest group invites you to share your activities and experiences at our Spring Workshop, “Learning from experience: Sharing applied threshold concept methods in instruction” on Thursday, April 20th at the State Library of Ohio. ALAO’s Instruction Interest Group (IIG) is looking for presenters who have designed and taught library assignments or activities that teach any of the six threshold concepts. Do you have fresh ideas you’d like to present? Now’s your chance! The deadline for proposals for is Feb. 15, 2017. To submit your idea, please click on the following link and fill out the form: https://goo.gl/forms/5nylQF3nUW6hYU1d2. Session proposals will be reviewed by the IIG planning committee. Please e-mail any questions to IIG Co-Chairs Dana Knott (dknott@cscc.edu) and Mark Eddy (mxe37@case.edu).